Spring has sprung. It’s finally here! The markets are bustling with activity, new produce is livening up the market carts, and I know I’m not the only one that’s ready to get in on the apricot, strawberry, cherry and asparagus action around here. It’s a bit too early in the season for strawberries, but at $3.00 for a 30 ounce package, I just couldn’t resist. I nibbled on a couple as I drove home from the store the other day, dreaming up ways I was going to bake them into my life. 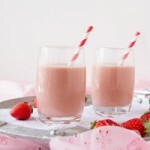 I’ve wanted to make strawberry milk for as long as I can remember. It was one of my favorite treats as a kid. Most of my pals went for chocolate milk, but not me. 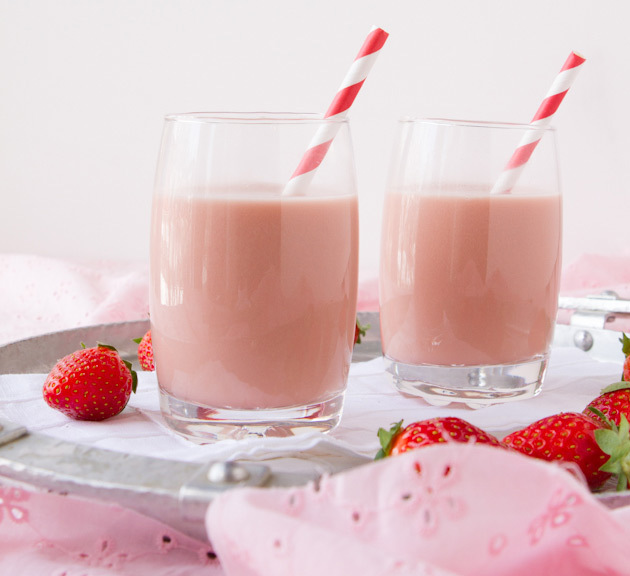 I was a strawberry milk gal through and through. Combine that with my burning curiosity of making coconut milk from the various random bags of shredded coconut I have laying around the house, and you have yourself a recipe winner! This stuff is dessert quality. It’s ultra-creamy, smooth and satisfying. It’s sweet, good warm, good cold, good hot. Just good. 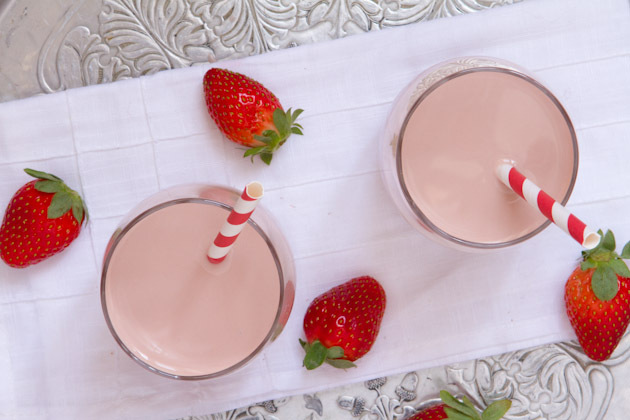 Refreshing strawberry milk that's ultra creamy with 0 animal products. Dessert in a glass! Add water, strawberries, sugar and vanilla to a small saucepan. Cover and bring to a boil. Reduce heat and simmer for 10 minutes. Remove from heat and add shredded coconut. Stir and set aside to cool for 15 minutes. Add mixture into the jug of your high powered blender. Blend on high for 2-3 minutes. Stop the blender, fasten your nut milk bag to the top of the jug of your blender and pour the milk through the bag and into a large bowl. Once all the liquid is removed from the jug, allow it to run through the bag. Squeeze the bag with your hands until all liquid has been pressed through. Set the fiber in the bag aside. Drink immediately or store in the fridge. Should be used in 3-4 days after making for best flavor and texture. Since there are no preservatives or fillers, the “cream” of the coconut milk may separate on the top if stored in the fridge. Just shake or stir before drinking. Natural food coloring can be added. I used 6 drops of this. You could also use beet juice! I've heard that paint bags from the hardware store work well as a replacement to nut milk bags but I have not tried it. To make sugar-free, stevia or xylitol could be used. I have not tested the amounts, so feel free to have fun with it and share your findings. All you have to do is boil the strawberries with the sugar and vanilla. Add it to a blender, blend, strain and you’re good to go. You could use the pulp for all sorts of things. I’ve been adding mine to smoothies, eating it as a snack (you think it’s weird but this stuff tastes amazing!) and spreading it on apple slices. Really, you need to make this now. I enjoy your comments so very much and I know everyone in our community does, too. Now it’s your turn… what’s one childhood treat that you’ve been dying to recreate to fit your current eating style? What dairy-free milks do you use in your home… why?